Blissful Sunday - On Trump, On Hillary, And What's Happening to Us? I know the election is driving us crazy. We have passed the US Presidential Election, despite people are intrigued by the results. Yet, what is happening to us now? Changes we expect might (not) come. Some bad news will keep coming, too. It's predictably unpredicted. Post-Trump Speech, the stock is rising again after giving us a surprise shock. The rally goes on. As for me, my family is 'apart'. But I'm telling you, like people always said about politics, 'poly and ticks'. You'll never win no matter who's winning. This is what most people are failed to see and to accept. Now, in Jakarta, only a few months to go for the governor election. While US have to deal with white or non-white differences, in this city, we deal not only with race, but also religion, as political game target. Again, we are all apart. We're divided into different streams, standing up for people we believe are standing for us. In Jakarta, now... even highly educated people lose their mind. Bashing their less favorable candidates with hatred and not-so educated approach and reactions---which, to me, is magnifying the truth that educated people in Indonesia doesn't show whether people have manner and dignity, and most importantly, conscience and logic. If I can be greedy, I shall add 'wisdom' to the previous sentence. As I always believe, religions makes us lose logics. But, let's learn from the two candidates who have more world spotlight for the election. What went wrong with Hillary? I always think she's more capable in 'making America great again'. She has the experience and vision. And, I'm a democrat. I believe in gender equality and pro choice in Abortion Rights. I learned a lot from her, from her books. Yet, on the other side, I do agree with Trump---which makes me accepting bitter reactions from the people who don't really get what is the real deal the world is enduring. First, I agree US should be more strict on immigrants. Why? ILLEGAL immigrants aren't welcome anywhere, why would Americans welcome them in US? I know that many of those illegal immigrants might have harsh trouble in their home countries, but I'm sure there must be somewhere else for them to stay.... and manage their papers legally. US is facing weaker economy state. They have lost jobs, manufacturing jobs are gone... What kind of better life they can give to those asylum seekers? It's just going to make things worse for everyone. What about immigrants who are illegal and being criminal? I think it is obvious why Trump needs to 'delete' those kind of trash for the sake of the country. Sadly, I have to admit that I really dislike him for being misogynistic (maybe) due to some scandals emerged during the campaign. I hate that he can't control his language while speaking to woman or when speaking about woman. Such disrespectful. I do understand, that this is a very difficult situation for Americans to choose whom to vote. If, there isn't any media propaganda, which I am disappointed about from Hillary's side. You see the media is being pro-Hillary. That's ok, though. But, not giving enough facts on Trump's vision? That's not ok. Somehow, I can't imagine how the life in US is like, right now. Is it true that they're going back? Holding conservative christian's belief? Pro Life and anti-gender equality and anti-LGBTIQ? Why does it sound like life people have in Jakarta---like living in a cave? Such attitude is so irrelevant, selfish, and disrespecting towards women and LGBTIQ. Making America to be Pro Life again...well, if you hold on to religions too much, you'll forget how actually God wants you to. To use your brain and be wise. We cannot let the government to rule over your body. Let say, if you see two pregnant women without husbands, it doesn't mean their lives and miseries are completely the same so you can apply one solution 'Pro Life' to be the answer for all. By being Pro Choice, you'r communicating that society should respect women as equal individuals like men who can be independent and responsible for their life choices. That's what I call as respect. Society needs to be supportive in everyone's distinguished and particular conditions for them to make wise choices which might impact the society in bigger picture itself. Once again, I learned from Hillary. "This is one of the worst possible choices that any woman and her family has to make. And I do not believe the government should be making it. You know, I've had the great honor of traveling across the world on behalf of our country. I've been to countries where governments either forced women to have abortions like they used to do in China or forced women to bear children like they used to do in Romania. And I can tell you the government has no business in the decisions that women make with their families in accordance with their faith, with medical advice, and I will stand up for that right." - Hillary Clinton on Abortion Rights, at Presidential Debate. Those three things are every important for me, a feminist, to fight for. 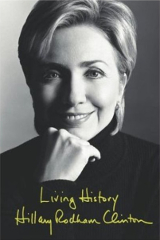 I read Living History by Hillary Clinton years ago (when I was in college). From the book, I learned, "Too many women in too many countries speak the same language, of silence..."
There, it's tough to choose. US Presidential Battle in 2016 has shown us really well... we're hardly winning in politics. Even though we can still expect good things coming up in US (I always hope 'we'll always have America' still possible), there are things we need to fight for. Again, over and over. I think, we're in the point where everything is still so biased. In Jakarta, religions close people's eyes and mind. Religions and races are the effective political vehicle in Indonesia. And that's what happening to us now. What's happening? It's just that we don't learn. Rally against Trump is on. Minority victim numbers are adding up. What happens therr affect how scared Indonesian majority are...and turning it back to minorities here, in a way, making it easy for politics to drive them. So who's gonna win? The game itself.